Training takes place on a Friday evening from 6pm to 10.30pm at Spelthorne Leisure Centre, Knowle Green, Staines. For those who have never fenced before we run a structured course of lessons in a friendly atmosphere. The Club has a large amount of equipment that any member of the club can borrow, so if you're just starting don't worry we will provide you with everything you need. Designed for younger and less experienced fencers this session is ideally suited for those looking to continue fencing after completing one of our beginner courses. Fencers are also welcome to stay on and fence with the intermediate juniors. For junior fencers with more experience we run an intermediate session. This provides fencers with a great opportunity to improve their technique and fence other people. The adult session is typically run with one or two foil poules and an epee poule. Fencers have the opportunity to have an individual lesson from one of our qualified coaches and take part in footwork sessions. At Egham Fencing Club we aim to provide a good and safe environment for all our fencers, especially our younger members. We've been awarded SwordMark by British Fencing. 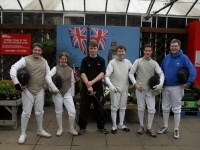 SwordMark is a fencing specific form of Sport England's Clubmark, a quality standard for clubs with junior sections. The award is an excellent recognition of the club's coaches, committee, fencers and the parents of our younger fencers for the hard work and support they put in every week to make our club a safe place to train, develop and compete. As a member of Egham Fencing club you get use of our club kit, access to individual lessons from our qualified coaches, and you get to be part of a fun and sociably club. Visitors are always welcome and can pay £10 (£5 for students) per night. Please note however that full members have priority for lessons from our coaches. If you already know how to fence feel free to join us at one of our sessions. Never fenced before? Don't worry we run regular beginner courses for both juniors and adults.